While some celebrated the arrival of the New Year by watching large objects plummet to the Earth, by January 1, 2018, a different new year was already well underway: the water year, which began on October 1st and runs until September 30th. The water year is of particular interest for us here at CIRC. Instead of watching meteors plummet to earth, we CIRCians have been watching our region’s precipitation fall. So far the numbers aren’t looking good for much of our region. The reason isn’t precipitation per se; it’s about how much of that precipitation has accumulated as snowpack. Snowpack numbers for mountains across much of Oregon and southwestern Idaho looked pretty dismal as of January 28, 2018, the time of this writing. However, snowpack in other portions of our region aren’t looking all that bad. This year’s snowpack is a story of haves and have-nots. In this issue of Northwest Climate Currents we’ll provide a snapshot of current conditions and a prospectus for what we hope is the better (and wetter) portion of the water year ahead of us. Let’s start with the basics. Over three-quarters of the precipitation that falls in a given water year in many parts of the Pacific Northwest occurs from October to May. Even more important is when that precipitation falls as snow and gets locked away as mountain snowpack. Unfortunately, the seasonal window for snow accumulation is notably shorter than that for rain for obvious reasons. Typically, most of the snow that falls in the Cascades and Rocky Mountains occurs from roughly the start of November through the end of March. The amount of accumulated liquid water in the snowpack (if we were to melt it) on April 1st acts as a kind of bellwether for regional water supplies. Years with low April 1st snowpack tend to be followed by low flows in rivers and streams during the summer that follows. This is particularly true of snowmelt-dominated watersheds. The result of this low flow can sometimes produce water challenges for irrigators. The calendar tells us that we’ve now passed the halfway point for the 2017/2018 Pacific Northwest snow season. So, how is our snowpack doing as of now? To answer that question, let’s use a set of resources developed for The Northwest Climate Toolbox. Below is a map of the Pacific Northwest showing snow water equivalent (SWE), or the amount of water we would get if we melted the available snow. As you can see, the SWE rankings for late-January across our region is a story of haves and have-nots—though really, it’s mainly have-nots. Okay, let’s unpack this map. What you’re seeing is a comparison of current (as of January 28th) SWE measures for this water year as measured against SWE measures for the same date (plus and minus a few days) for the years 1981–2010. The map breaks down this comparison into percentiles. Warm colors—reds and peaches—correspond roughly to the 0–33rd-percentile range and represent dry conditions. Those washed-out colors in the 33rd–66th-percentile range represent a kind of average, not too dry and not especially wet. And the cool blues in the 66th­–100th percentile range represent wet years. Aside from some blue areas in northwest Montana and extending westward into the Idaho panhandle and northeastern Washington, most of the map is looking pretty red (not a great color if you like snow). In fact, as of January 28th of this year, much of Oregon and southern Idaho are well behind normal, hovering in the bottom 20% of years for the same calendar date. This is not good. On the bright side, SWE numbers across much of the central and northern Washington Cascades were respectable, with values in the middle of the pack. And a few regions of SWE values in the top 20th percentile (i.e. the blue range) were seen in western Montana and extending westward into the northern Idaho panhandle and mountains of northeastern Washington. The current water year (water year 2017/2018) started off wet and cool here in the Pacific Northwest. Snow accumulated in the Cascades during October and November. By Thanksgiving, things were looking good. Snow was packing onto our mountains at a respectable rate. But then things changed. A warm atmospheric river event in late November took a bite out of mountain snow water storage in the Cascades. Rain fell on the ripening snowpack, melting a decent portion of it and producing localized flooding. Since then, a stubborn ridging pattern—an area of high atmospheric pressure similar to the one that aided our recent historic drought—has set up shop across much of the western United States for the past two months and was still hanging around as of this writing on January 28th. This led to a dry spell that has resulted in serious snowfall shortfalls across much of Oregon and southwestern Idaho, impacting winter recreation and leading water managers in many basins to take note. By contrast, storms have favored a more northerly route through Washington state and eastward into Montana, where precipitation accumulation since October 1st is at or above normal. Watching snowpack accumulate over the winter is a bit like watching a basketball game between two teams with streaky shooters. Meaning, don’t count a team out with plenty of time to mount a comeback. Yes, we’re starting the second half of our snow season with a big snow deficit across Oregon and southwestern Idaho, but we do have a big reason for optimism: the La Niña event we are currently experiencing. La Niña winters, like the one we are currently in, have tended to favor cooler and wetter conditions in late winter in the Pacific Northwest. And just like a shooter that regains his or her touch, atmospheric circulation patterns can change to a more favorable regime for building snowpack. Although, this year’s La Niña event might not come through for us. Forecasts issued by NOAA’s Climate Prediction Center for the next several weeks are not encouraging. The Center predicts greater odds for warmer and drier conditions for much of the Pacific Northwest, not good news for snow lovers. Whether Oregon and southwestern Idaho can make a comeback from their current hole is something that we’ll be tracking in the coming months using the Northwest Climate Toolbox and through our upcoming series the Pacific Northwest Drought Early Warning System Drought & Climate Outlook Webinars. The next webinar is February 26th at 11 a.m. Pacific. 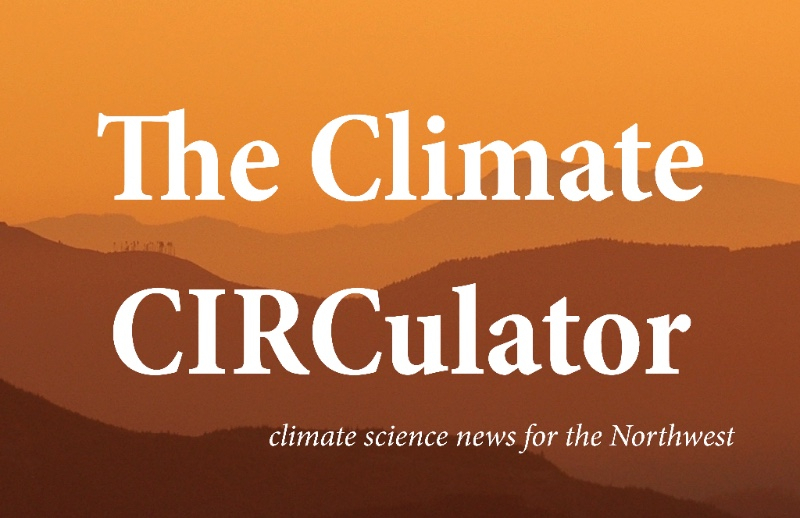 This post is part of an ongoing series we are calling Northwest Climate Currents. Northwest Climate Currents uses the Northwest Climate Toolbox and the data it collects to help us understand and prepare for our region’s climate events. The Northwest Climate Toolbox is a suite of free online applications designed by CIRC researchers and intended to help foresters, farmers, and water managers respond to and prepare for climate variability and change and related impacts. The Toolbox takes in raw climatological, meteorological, and hydrological information, translating them into a series of easy-to-navigate tools and interactive maps that allow users to plug in their location and visualize data for that location. Acknowledgements: The Northwest Climate Toolbox was funded in part through the NOAA Regional Integrated Sciences and Assessments (RISA) program and National Integrated Drought Information System (NIDIS). Research by this Post’s Author, John Abatzoglou. John Abatzoglou has been a CIRC team member since 2010. A climate and meteorology researcher at the University of Idaho and self-described “weather weenie,” John leads CIRC’s Northwest Climate Toolbox effort. He has participated in the creation of several CIRC-related Climate Tools, including Climate Engine and Integrated Scenarios. More Posts by this Author.